A subseafloor image of the Gulf of Mexico acquired using a towed acoustic system. Click image for larger view. The seafloor sediment-water interface is a critical, porous boundary that permits the exchange of energy and material into and out of the sedimentary section. Marine ecologists often can rely almost exclusively on sampling organisms or sediments at or just below the sea floor to describe habitats. However, scientists who study geology, fluid flow, or physical properties (e.g., seismic velocity) at depths of tens to hundreds of meters below the sea floor typically do not have access to direct sampling techniques, except when deep-ocean drilling is possible. Therefore, these scientists must use special techniques to visualize the sediments below the sea floor. 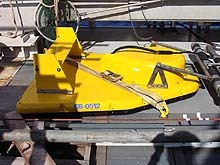 The yellow instrument is Georgia Techs Edgetech 512 system, which is known to scientists as a fish. The instrument is towed on a cable at tens of meters below the sea surface. The instrument sends out a relatively high frequency acoustic pulse that is then reflected off the sea floor and shallow features within the sedimentary column. Click image for larger view. During the 2003 Windows to the Deep expedition, researchers will use the Alvin submersible to directly view areas, map the area's bathymetry using a hull-mounted system on the R/V Atlantis, and use an acoustic profiling system that images the uppermost tens of meters of the sediments. Such images provide information about the shallowest part of the subseafloor. They will provide detail about a depth range that will help us understand the link between seafloor chemosynthetic communities and the deeper plumbing system in gas hydrate zones below the seafloor surface. This schematic demonstrates the principle underlying subseafloor imaging with an acoustic system. Click image for larger view. Windows to the Deep will use a Chirp subbottom profiling system to image the shallow subseafloor. The acoustic source can be mounted either within a fish that is towed below the ocean surface or on the hull of the ship. 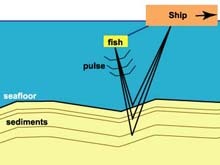 The system transmits an acoustic pulse that is later received by a transducer listening at the frequency of the pulse and located just below the ship. After the signal is transmitted, it travels through the water column, is reflected off shallow features in the subseafloor, and then returns (bounces) back to the transducer through the water column. When the pulse encounters sediment layers, gas bubbles, faults, or other features, the pulse is slightly changed and reflected in different ways. These different "echoes" produce a clear image of the shallow sedimentary section. The bathymetric map on the left shows the location of the three Cape Fear diapir Ocean Drilling Program sites. The gray area marks reflective sea floor. Click image for larger view. 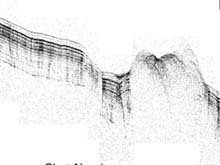 Older subbottom images of the Blake Ridge and Carolina Rise have helped guide past research in these areas, even when the gas hydrate itself lies many tens of meters or more below the sea floor. Older images of the shallow sediments beneath the Cape Fear and Blake Ridge diapirs have revealed seafloor pockmarks (depressions) and gas-charged sediments, but these images provided relatively few details about the subseafloor itself. These older images were acquired for survey purposes only, but the Windows to the Deep images will provide much better resolution of the areas close to the sea floor. 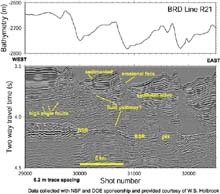 High-resolution multichannel seismic data collected in the study area in 2000. These data provide critical information about the deeper and larger-scale sedimentary and flow features in the subseafloor. Click image for larger view. The Windows to the Deep expedition will also make use of high-resolution multichannel seismic data that W.S. Holbrook (University of Wyoming), D. Lizarralde (Georgia Tech), and I. Pecher (now in New Zealand) acquired in Autumn 2000. The figure to the right shows a seismic line across the Blake Ridge depression. This feature, which will be observed for the first time during this expedition, will be explored for methane emissions. This very high- resolution image reveals the distribution of gas hydrate and free gas to depths of hundreds of meters. The new subseafloor images that we will take will provide greater resolution. This will allow us to better study features near the sea floor, just beneath methane seeps and potential chemosynthetic communities.